In March of 2013 I finally got on the bandwagon of doing offsite backups. 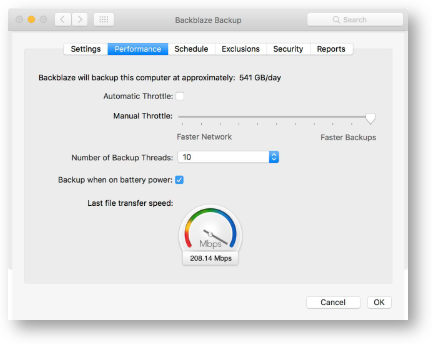 Backups in general are the kind of task that sounds hard and annoying but if you haven’t tried lately are easy. Once I had CrashPlan running, it ran flawlessly for three and a half years. One of the features I liked about CrashPlan is that when you get a new machine, they allow you to adopt the previous backup. That means that you don’t have to re-upload all of your data, you just tell CrashPlan to point the old backup to the new machine. Fast forward to November of last year when I got the new Touch Bar MacBook Pro. I happily installed CrashPlan and told it to adopt the backup of my 2013 Retina MacBook Pro. And that’s when the nightmare started. 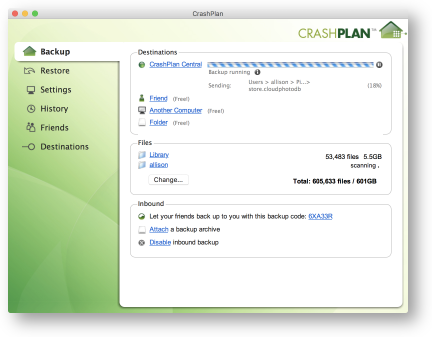 CrashPlan goes through several phases during initial backup and also during adoption. It likes to synchronize file information. It likes to synchronize block information. One of my favorites is Cache Pruning versions. Sometimes it even likes to start running the backup. It gets bored with that though and goes back to the old standby of synchronizing block information. I failed to get CrashPlan to complete a single successful backup on my new machine for a full month. On December 28th I finally wrote to Code42, the makers of CrashPlan. My little friend Lawrence from Code42 and I began a long and stressful relationship. To give you an idea of how many conversations we’ve had trying (unsuccessfully) to get this working, I copied and pasted our email thread into ByWord and found we have written 9450 words to each other … so far. When Lawrence was helping, he seemed to know what he was talking about and do some real work. He was trying to clean out files that appeared to be boogering up the database (my words, not his) and doing other maintenance that required me to uninstall and reinstall. Even when things appeared to be working, CrashPlan would upload at a positively glacial speed. I’m talking 300KB/sec on a good day. He would assure me that it would speed up eventually and the screens that said “3.4 months to go” weren’t correct. I have around 700GB online at CrashPlan, so at the speed of 300KB/sec, that would be 216 days to complete (if my cipherin’ is correct). But the worst part of all of this is that twice Lawrence fell ill. Worse for him than me, I’m sure. But CrashPlan had no one reading his email to ensure that his customers were cared for! At one point, 8 days went by with no response from my repeated attempts to ask him what was going on. Finally in desperation I tweeted Code42 simply asking them to check to see if Lawrence was ok. Seriously, I wasn’t mean at all, I really wondered if he was ok.
After that tweet, Donny stepped in for a few days at which point Lawrence and I were reunited. As I explained to both of them, I think it’s inexcusable for a company to leave a customer unable to use the service for which they’re paying just because the one person they were working with was out ill. But here’s where the story takes an interesting turn. My good friend Pat Dengler of Dengler Consulting has been nagging me for ages to dump CrashPlan in favor of Backblaze. In her Apple Certified consultant’s role, she’s found it easier and better than CrashPlan and highly recommended it. So while I was waiting for Lawrence, this week I downloaded the free 15 day trial of Backblaze. I told Pat that I was doubtful this would be enough time for a real test, because in 2013 when I did my initial backup to CrashPlan, it took 3 weeks for all of my data to go up to their servers. I soldiered on with my testing in spite of my concerns. Where CrashPlan is a Java application (which is inaccessible by the way), Backblaze installs as a System Preference pane. It has six tabs within it and my favorite is the Performance tab. By default, Backblaze has automatic throttling. You can imagine that if you’re trying to watch Netflix, you probably don’t want your backup sucking up all of your available bandwidth. But in my case I actually do want to flood the pipes. If you disengage automatic throttle, you get a slider from left to right with faster network on the left, and faster backups on the right. Needless to say, I pushed it to 11. You also get an option to set the number of backup threads. They recommend 1 thread, but since they gave me an option of 10, I chose that. At this point, I should mention that I’m lucky enough to have FiOS in my house, so I regularly see 80-100mbps upload on speed tests. After I cranked up Backblaze to the fastest possible, I was shown a transfer speed of 208.14Mbps. Remember CrashPlan? That was at 2.4mbps. So 100x the speed. But could Backblaze really do this in an actual upload? I deselected only my Movies directory and which left it close to 650GB to back up to the Backblaze servers. And I pushed back up now. I left it running in the background, fully expecting this to take weeks. But it didn’t. Instead….it only took Backblaze 18 hours to upload 641GB of data. 735 thousand files. Seriously. It finished in far less than the elapsed time between any of my requests to Lawrence to receive a reply. The entire time it was uploading, it showed me what file it was working on and how many files were left and how much data was left to upload. Great feedback so I knew exactly how well it was going. The system preference pane for Backblaze also has a schedule tab which you can change from continuously (which they recommend) which is actually hourly, or you can choose once a day, or only when you push the backup now button. You can use the Exclusions tab to keep Backblaze from backing up specific folder, or even by file extension type. There are a fair number of file types not included by default. For example if you have sparse image bundles or you save disk images of installers, those aren’t backed up. Probably good to take a look at that section to make sure nothing you care about is in the list. Files scheduled for backup are encrypted on your machine using AES military grade encryption. These encrypted files are then transferred over a secure SSL connection directly to the Backblaze data centers, where they’re stored encrypted on disk. Data will only be decrypted per your request using your email and password. If that’s not enough for you they go on to explain how you can create a private encryption key to secure your data. If you choose this option, you have to safeguard this private encryption key, because they will never be able to decrypt your data for you. Finally they have reports that are really fun. I can see how many files I have backed up, and a high level understanding of their final types. For example, it shows that I have 400 GB of photos and movies, and only 16 GB of music. And to be honest, I’m pretty sure it’s mostly podcasts in that music category, stored in my iTunes library. In that same report tab you can also check to see if there are any issues pending for your next backup. On the settings tab you can set when you want to be warned if you haven’t been backed up, anything from 1 to 7 days or even never. Also on the settings tab you can inherit a back up state from a previous computer. This is exactly like the backup adoption that I mentioned you can get with CrashPlan. I also ran a successful test to make sure I can retrieve files. You log into your Backblaze account on the web, identify the files that you want to retrieve, and then they zip them up and send you a link to download those files. Zip file downloads are limited to 500GB (which is probably enough for most normal people), but if it’s not you can submit up to 5 concurrent. If you have a medium-size catastrophe, up 128 GB GB of data you need to retrieve, you can choose to have them send you your data on a USB flash drive for $99. If things really go belly up on you, they’ll send you up to 4 TB of data on a hard drive for $189. Get this though, if you send the flash drive or the hard drive back, you get a full refund. That’s pretty cool. For a single computer, CrashPlan and Backblaze are the exact same price. If you pay for a full year in advance, they both charge $5/month. CrashPlan has one edge over Backblaze, and it’s that they also offer a family plan. You can back up 2-10 computers for $12.50/month. Backblaze doesn’t offer a family plan, so if you have a lot of computers for which you require offsite backups, CrashPlan would be a better deal for you. CrashPlan also allows you back up network attached storage, which I always thought I’d do but never even tried. Backblaze recommends Synology NAS because they have their Cloud Sync software which syncs to Backblaze’s B2 service. Needless to say, I’m switching over to Backblaze because of the nice interface, and because of the speed, and well, mostly because they actually can back up my computer. Drat! I just renewed CrashPlan last month. I’ll explore changing over when this year is over. I recently had an experience somewhat like you when I played musical Macs, handing down my MBP to my wife. CP just wasn’t backing up her new machine. I ended up uninstalling and reinstalling and it started. Fortunately, I was able to get CP to adopt the previous backups. We have enough computers that it makes sense for us to use the family plan. But I decided to use Backblaze to back up part of my Synology server. I used Backblaze’s B2 service to backup just my 262GB of photos (~60k files). I don’t use them to back up my media because it’s much larger (~5Tb) and more dynamic. I have local backups for the user and media files, as the time and cost is also a factor–dont have near your upload speed. Backblaze gas been a very good experience for me. Thanks for the information, David. Glad CrashPlan worked for you. I really did think it was terrific…until it wasn’t. I think I gave them a pretty good chance to fix things. Good to know Backblaze’s b2 service does work with with Synology. Very cool solution. I keep looking askance at my Drobos and wishing they would fail so I could justify a Synology! Now this is interesting. 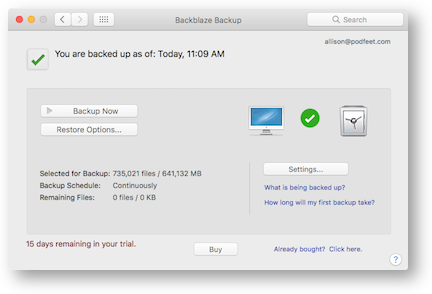 For the past few years I’ve used Backblaze to back up my iMac and CrashPlan to back up my MacBook Pro. No issues with either of them until just the past couple of weeks, I’ve noticed that for inexplicable reasons the MBP backups take HOURS to run. (I have not changed computers; this is happening all of a sudden on the same MBP I’ve had CP running on for about 4 years. I have very fast wifi here, but the speeds showing on the CP dashboard when it’s backing up are incredibly low. I thought maybe something was going wrong with my MBP. I started with iDrive a few years ago. After a week, with the initial backup still not done, I switched to Backblaze, which has worked fine. I have had to retrieve single files a few times, no problem. I just switched from a MBP to an iMac. BackBlaze was backing up the MBP. It was pretty easy to set things up so that the current backup was only updated by the iMac. I emailed support to clarify the online instructions and the person I got knew what he was talking about. I retrieved some files as a test after it was all done and that process also worked fine. I also have Time Machine going and do a monthly disk image with Carbon Copy Cloner to be stored offsite. Finally! I think I probably started mentioning Backblaze over CrashPlan to you around the same time Pat did. Glad she bugged you more than me. My issues with CrashPlan were the slow speed (and including their patronizing but useless response when I questioned it), and the awful Java interface which not only didn’t behave like a Mac app, but also just didn’t behave some times. Like individual progress bars that scrolled vertically. Figure that out! Backblaze isn’t as flexible, but does exactly what it says on the tin. I have over 3.5TB backed up from 3 computers and I never worry about it. Glad to see you’re a Backblaze fan, Allison. Have been using it for about 2 years and recommend it to my clients. So easy. My clients (and I) have never had an issue with Backblaze. +1 for Backblaze. When I had to replace my external storage drive and its clone, I was pleasantly surprised to see I could just inherit my existing backup. That saved tons of time because they were clones of my originals that were failing. It’s also so affordable. I really love them. I visited with a Backblaze rep at RootsTech 2017 today and after reviewing what they offer for the cost vs Crashplan, we’ll be moving to Backblaze when it comes to renewal in a few months. I already use Backblaze B2 to backup some volumes of my Synology server and have been very happy with that experience. As always the proof of the pudding is in the eating. I lost ALL my videos due to a system crash this week, Crashplan allowed me to restore all of them even though some were removed from active memory in 2013. So no, I’ll stay with crashplan, they saved my bacon! Great story, Janov. This is like when I left LastPass for 1Password. There was just this one problem that the LastPass folks could not fix for me (it left me logged in and disobeyed the auto-timeout). Nothing bad about LastPass or CrashPlan, but if something doesn’t work for you, you gotta bail. And like wise, if CrashPlan is working for you that’s fantastic. Great testimonial too on WHY we should have offsite backups. You’re right, always stick to the backup 1,2,3 system! One big advantage with CrashPlan is that there also a local backup capability! I run the Crashplan app on my Mac mini server and while I backup up my laptop to Crashplan Central for off site storage, all the Macs, including my laptop also backup to Crashplan on my Mac mini! If you have a friend or family member on a. fast network, you could even back up to each others machines as well! I don’t think this is possible with Backblaze! I found this review after having made the decision to switch and can only echo its sentiments and experiences. I’d been with CrashPlan for many years and was always happy, despite the agonizingly slow upload/backup speeds. 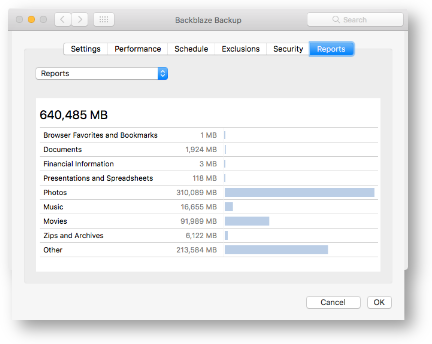 The backups have saved me several times. But I’m going to leave them and have advised everyone I know – I’ve referred some 40 or so accounts to them – to leave as well, in favor of Backblaze. The reasons are that CrashPlan’s pricing is about to go up dramatically and, at least as importantly, that their customer support – which was excellent when I first signed up, many years ago – has deteriorated over time, to the point that my latest interactions with them were filled with ineptitude, callousness, and tardiness. Any one of those qualities would be bad enough. In combination, they’re a death knell.